DOVER, Del. 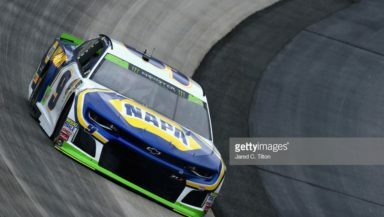 (Oct. 7, 2018) – Racing fortune in NASCAR’s top level came full circle for Chase Elliott Sunday at Dover International Speedway. A year after enduring perhaps his toughest defeat, the 22-year-old fan favorite stayed on the track while his rivals pitted and survived a green-white-checkered restart with old tires to secure an unlikely victory in the “Gander Outdoors 400” Monster Energy NASCAR Cup Series playoff race. It’s the first speedway victory in the Monster Energy NASCAR Cup Series for Elliott, who earned his first Cup Series triumph earlier this year at Watkins Glen, and locks in his advancement into the postseason’s Round of 8. The victory comes one year after Elliott led a race-high 138 laps at the Monster Mile before being passed just before the white flag by Kyle Busch and having to settle for second. On Sunday, it was the Dawsonville, Ga., native who finally got to lift the Monster Trophy. Elliott, in the No. 9 Chevrolet owned by Hendrick Motorsports, topped runner-up Denny Hamlin by less than three-tenths of a second on a green-white-checkered finish that was forced when a five-car wreck along the backstretch led to red flag conditions. Elliott had stayed out during a previous caution period, electing to keep old tires and gain track position. On the final restart, Elliott cleared Hamlin on the outside lane and held on for the checkered flag. “I thought Chase was a sitting duck with the older tires,” said Joey Logano, who finished third. Among other playoff drivers, Kurt Busch placed fifth, Kyle Busch finished eighth, Ryan Blaney was 11th and Kyle Larson landed in 12th. Before Elliott hopped on top of his car and celebrated at the start-finish line, two other drivers figured to be clear favorites to reach Sunoco Victory Lane. Harvick led a race-high 286 laps and claimed the playoff points from two stage victories before a bad bounce with a lugnut on pit road caused him to go a lap down. He eventually fought back to finish six. After Harvick’s bad luck, his Stewart-Haas Racing teammate Aric Almirola grabbed the lead, and looked to be on his way to a surprise win before Clint Bowyer, yet another SHR star, spun in Turn 3 and brought out the race’s fourth caution flag. After Bowyer’s crash, the majority of the field came in for two- or four-tire stops. Elliott stayed out, and it proved to be a race-winning call. Elliott covered the race’s 404 miles in 3 hours, 18 minutes and 2 seconds with an average speed of 122.404 mph.